The primary cooking area measures 624 sq. Inches; the warming rack area measures 145 sq. Inches, giving a total cooking area of 769 sq. Inches. This Weber gas grill Summit E-670 also has a 12,000 BTU per hour input flush-mount side burner, 8,000 BTU per hour smoker burner and stainless steel smoker box, a 10,600 BTU per hour infrared rear mounted Rotisserie burner and a 10,600 BTU per hour dedicated sear burner. 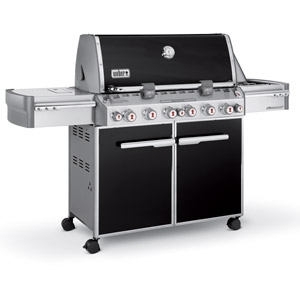 Other features include a Tuck-Away Rotisserie system, (2) stainless steel work surfaces, (1) Grill Out handle light, (6) tool holders, enclosed tank storage and precision fuel gauge, (2) heavy-duty front locking casters and (2) heavy-duty back swivel casters. Tank is not included with Propane grills. Weber cookbook included.